A new Kickstarter project is aiming to allow photographers to backup their files without a computer. Flash Porter is a portable backup system that can store up to 2TB of data cord free. Flash Porter aims to help photographers, videographers, and even casual smartphone users avoid the nightmare of lost files via multiple backup options in the field, including SD cards, micro SD, CF cards, and USB. Designed by the start-up DFI Gear, the company says Flash Porter is seven times faster than using a camera’s high-speed USB, with a copy speed of 35 MB/s. Using the 3.5-inch screen, users can choose automatic backups or organize with folders, then check to ensure the backup was successful. The screen also doubles as a way to preview images in the field, including a zoom option that can help photographers determine if the focus was accurate or not. The system can open multiple types of RAW files and is also compatible with smartphone backups, though smartphone backups aren’t cord free. 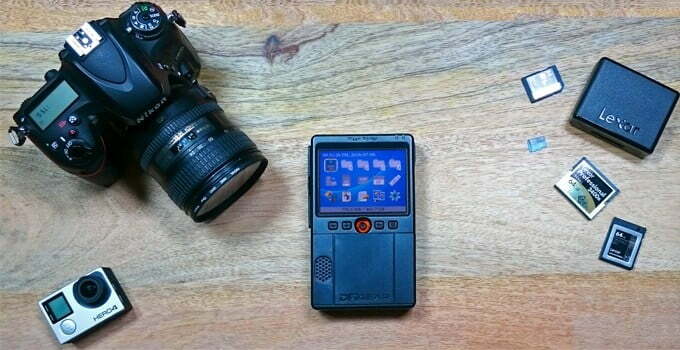 If the Kickstarter reaches a $100,000 stretch goal, the Flash Porter will be adjusted to include built-in wireless. Plugged into a computer, the Flash Porter can be used just like an external hard drive, with USB 3.0 for transferring files to the computer’s hard drive, or the possibility of simply working off the Flash Porter. The company designed the Flash Porter as an alternative to carrying a laptop in the field for backups on important shoots and to provide a simpler file management system. The Flash Porter can use automatic backup modes, manual options where the user selects what to copy and where, and can also identify duplicate files. The portable system can also be backed up to an external hard drive without a computer to connect the two. With the Kickstarter already fully funded, the Flash Porter will ship in both HHD and SSD options, with the SSD offering faster performance as well as better durability and battery life at a higher price point. The pledge options, excluding the early bird options, start at $249 for the 500 GB HHD option, $50 off the expected retail price. The drives move up from there, with capacity options up to 2TB.